Please contact the Trip Coordinator immediately after signing up for the trip to request a single supplement. Register Here On/After Aug. 13th! Existing Participants see your registration or Make Payments on your Balance at your profile. 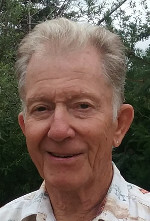 The full package has been reduced to $1,352 from $1,451; the land package has been reduced to $835 from $853 and the single supplement has been reduced to $805 from $823. In addition, we are now flying Southwest Airlines out of Hobby instead of United out of George Bush Intercontinental. For those registering for the full package, Southwest allows 2 free bags each way for an additional $140 savings (based on United's current baggage fees). If you don’t like crowds and you do like powder, this is the trip for you. 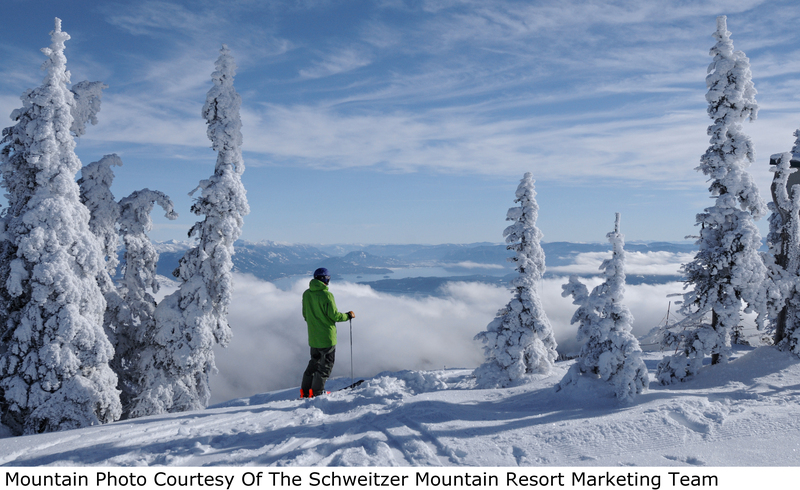 Located in Sandpoint, Idaho in the Selkirk Mountains, Schweitzer is 95 miles Northeast of Spokane International Airport and 45 miles South of the Canadian border. 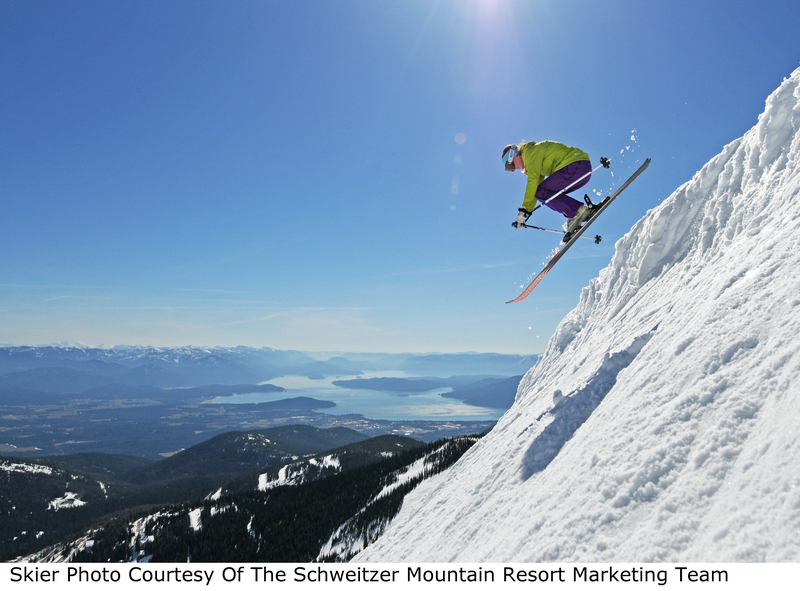 Opened in 1963, Schweitzer is known for great tree skiing, outstanding snow and views of three states (Idaho, Washington and Montana), Canada and beautiful Lake Pend Oreille. 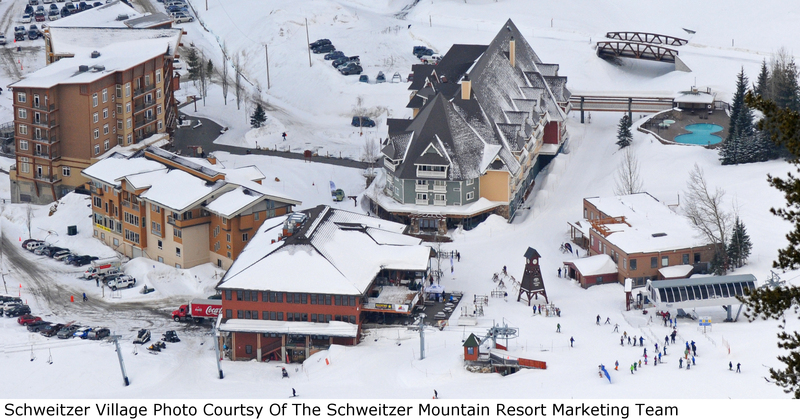 Schweitzer is the largest ski area in Idaho (bigger than Sun Valley) and Washington. Home to incredible bowls, chutes, groomed cruisers and some of the best tree skiing in America (over 1,200 acres of trees!! ), Schweitzer offers something for everyone. An efficient network of lifts whisks skiers and riders to the top in minutes. With a total uphill capacity of 12,502 people per hour, lift lines are rare to non-existent. The mountain has two wide bowls, Schweitzer Bowl on the front side (where we're staying) and Outback Bowl on the back side. Walk to either the Great Escape Quad or the Basin Express Quad to reach a mix of blue runs and single black runs or ski down to the Sunnyside chairlift for some great tree skiing. For the novice skier, there is a dedicated beginners' area located below Schweitzer Village with its own chairlift (Musical Chairs) and a magic carpet. The Outback Bowl is accessed using the Great Escape Quad or the Sunnyside chairlift. There are several double black runs coming off the top but there are also plenty of single black runs and blue runs, including the Little Blue Ridge Run which is Schweitzer's longest continuous groomed run at 2.1 miles. In addition to ski and snowboard trails, the resort boasts 32 kilometers of Nordic trails for cross-country and skate skiing, snowshoeing and fat tire snow biking. For more fun, try snow tubing at Hermit's Hollow Tubing Center with 2 side-by-side chutes stretching over 100 yards or check out one of the 3 terrain parks (Stomping Grounds, Southside Park and Terrain Garden) which are built nightly by people who ride daily. The resort has its own cat skiing operation, Selkirk Powder Company. If you've never been cat skiing, this is the perfect opportunity to give it a try. Day long adventures start from the summit and have skiers on untracked backcountry powder by 9:30 in the morning. Skiers typically complete up to 10 runs and rack up as much as 14,000 vertical feet on 4,350 acres of diverse terrain. 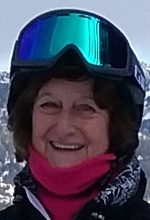 Selkirk Powder Company also offers guided snowmobile tours along groomed logging roads through thousands of acres of private and state-owned forests and has the only heli-skiing operation in Idaho. 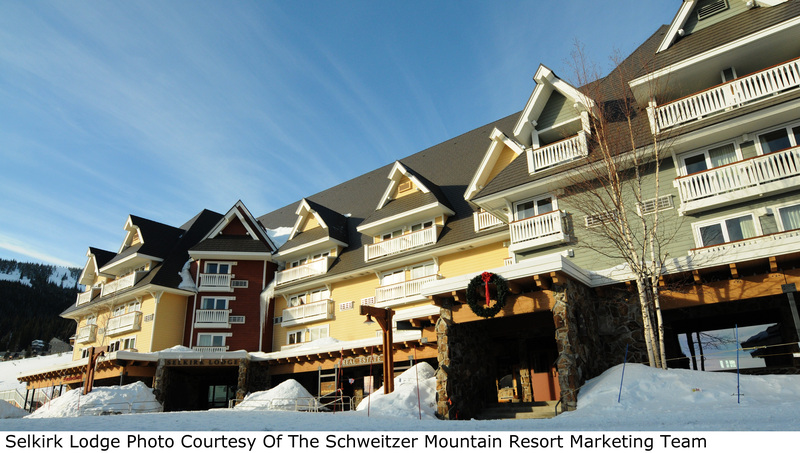 We will be staying at Selkirk Lodge in the heart of Schweitzer Village. The lodge features hotel-style accommodations with an option for one king or two queen beds. Our rates are based on double occupancy but a limited number of single supplements are also available. The lodge is a short walk to the base area and the lifts. Three outdoor hot tubs and the resort’s heated pool are just steps away. A micro movie theater is located onsite and shows three family movies a day. There is also an onsite spa which offers massages and a variety of other services. A daily hot breakfast is included in the package. This is a great opportunity to meet with fellow skiers and plan your day. Other lodge amenities include unlimited wireless internet, unlimited local calling, in-room coffee and hot cocoa, onsite laundry facilities, free safe deposit boxes at the front desk, daily newspapers, a business center and free ski and snowboard storage. 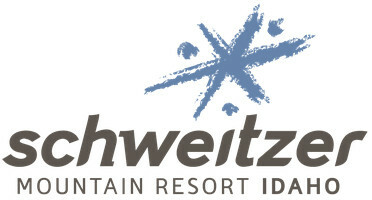 We will arrive at Schweitzer Village early Sunday evening and, after everyone is checked into the lodge, there will be a welcome reception with representatives from both Schweitzer Mountain Resort Idaho and Ski White Diamond in attendance to answer your questions. The reception will include a baked potato bar with soup, salad, a dessert and one drink. On Monday, there is an optional full mountain tour for anyone who is interested. There will be time to have breakfast and pick up equipment rentals before the tour begins. There will be daily suggested lunch and happy hour meeting places as well as some optional group dinners. There are a couple of lunch options on the mountain, Sky House at the summit and Outback Inn at the base of the Stella 6 lift. Sky House offers a restaurant, full-service bar and café and 360-degree stunning views of the Selkirk Mountains, Lake Pend Oreille and the entire resort. Outback Inn is ski only access and offers burgers, potatoes, soups and beverages. There are several dining opportunities in Schweitzer Village. The Mojo Coyote Cafe and Chimney Rock Bar & Grill are conveniently located in Selkirk Lodge. Additional casual dining and apres ski options are located in Lakeview Lodge and White Pine Lodge which are both within walking distance of the Selkirk. There is a small market in the Village as well as shops which sell gear essentials, specialty equipment and demo rentals. There is also a local artist cooperative which showcases drawings, paintings, jewelry and more. For more shopping and dining options, Schweitzer’s home base is the music-and-arts-loving town of Sandpoint. Voted by Rand McNally as the Most Beautiful Small Town in America, Sandpoint is located on Lake Pend Oreille. To get to Sandpoint from the Village, catch one of the hourly shuttles from the Red Barn parking lot. Visit Sandpoint’s website www.VisitSandpoint.com for information on year-round and winter activities in Sandpoint. There is an optional "Trip to Town" which will be a great opportunity to check out Sandpoint. The trip is currently scheduled for Monday evening and includes private transportation to and from Sandpoint, a stop at one of the town's hot spots for a glass of local wine or a pint of MickDuff's beer and a delicious dinner at Ivano's Ristorante Italiano www.ivanosrestaurant.com. The cost for the trip is $60 per person. Please contact the Trip Coordinator to register for this event. We leave Hobby Airport on Sunday, March 3rd at 7:30 a.m. and arrive in Spokane at 2:40 p.m. with a 3.5 hour stop in Phoenix. On Sunday, March 10th, we leave Spokane at 1:30 p.m. and arrive in Houston at 11:20 p.m. with a 3-hour, 20-minute stop in Denver. All flights are with Southwest Airlines. The trip to and from Spokane will be in a luxury private coach. There will be a short snack and alcohol stop on the way to Schweitzer Village on Sunday afternoon. Equipment rental is available at the Ski and Ride Center located next to Selkirk Lodge. Information on discounted rentals will be available at the pre-trip party. If you are interested in a group or private lesson or a specialty clinic, we will also be providing information on ski school options.